1. Toss the spinach, tomatoes and basil-infused oil together, and place on 2 plates. 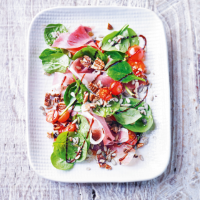 Top with the Parma ham and toasted pecans (if using). Drizzle with the balsamic glaze and sprinkle over the mixed seeds.